Learning Git can be a bit challenging for developers with a background in centralized version control systems. But it doesn’t have to be that way. Git is becoming (or has already become, many would say) the de facto standard version control system of the industry. It was created in 2005 by Linus Torvalds to manage the source code from the Linux kernel, and since then its adoption has been growing phenomenally, specially after Github showed up. However, even after all this time, there are some myths about Git that just won’t die. One of them is that Git is super hard to learn. From my experience, I can say that this isn’t true. Git was meant to provide a lot of power and flexibility to its users. It certainly allows you to use it in more complex or sophisticate ways. But in practice, the basic commands you will use to get your daily work done are not that hard to learn. That being said, Git’s learning curve may present some challenging to people that are used to centralized systems. I think it’s human nature to try to find patterns and to map concepts between what you already know and what you’re trying to learn; but there are significant differences and this “mapping” often results in frustration. With that in mind, I’ve decided to write a series of posts to try to help developers who are coming from centralized systems (specifically TFS/TFVC) and trying to learn Git. I don’t intend by any means to exhaust the subject. Quite the opposite: when necessary, I’ll provide links for more in-depth explanations of certain topics. TFS stands for Team Foundation Server. It is a Microsoft product that offers capabilities such as project management, requirement management, build automation and release management. TFS also offers version control capabilities. Since TFS 2013 there has been native support for Git, but before that it was only possible by using TFS’s own version control system, which is called Team Foundation Version Control (TFVC). So, TFS refers to the complete application life-cycle management solution. The version control system itself is called TFVC. However, in this article I’ll be calling the version control system “TFS” since many developers colloquially call it that way. Send the code with the changes back to the server. So, you can see that the “check-in” command in practice has two meaning associated with it: “saving” changes and “sending” those changes to the server. What I notice is that this notion of “I’m going to send my changes to the server” is a little bit hard to let go when you’re making the transition. Remember: In Git there is no such thing as a central server. What you have instead are remote repositories, usually called just remotes. You can have as much remotes as you want to. And they don’t necessarily have to be that remote. Yes, they could be on GitHub or something similar. But they could also be located on your coworker’s machine, on some network drive, or even on another folder in your own machine. When your work in a team it’s common to set up a repository that is considered, for organization means, the official repository, which holds the code’s true and current state. One more time: in Git doesn’t have a technical concept of a central repository; what’s described above is a convention. With that in mind, let’s practice some Git commands so you can get used to them. Today we’re not seeing anything regarding remotes, server, nothing like that: just local commands. Some people say that using Git on Windows used to be a pain. Fortunately, that isn’t the case anymore, as you’ll see. First, download Git for Windows. When you get to this screen, choosing the second option you allow you to use Git from the Windows command prompt, and not only from Git Bash. After you’re done installing Git, it’s time to configure your identity, which consists in telling Git your name and email so it can associate them with each commit you make. In order to do that, let’s use Git Bash. 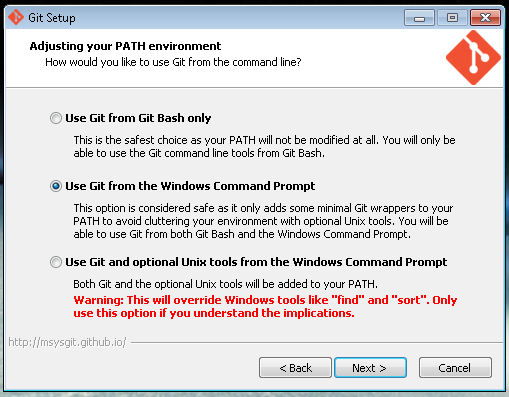 Locate “Git Bash” on Start Menu and run it. Git Bash’s window will be shown. There are a lot of other configurations available, but this is enough for you to be able to explore Git. Nothing mysterious: logged user, current location and current branch. In Git, the standard branch is called master. In the next post we’ll learn some basic operations in branches, but for now we’ll be using just master. OK, now you’ve got your repository, time to learn some commands. Let’s starting with one that you’ll probably use a lot: git status. This command allow you to visualize the current status of your repo. it shows what will go in the commit - which in this case is nothing, since we haven’t made any changes. Git even tell us what the next possible step is, i.e. create or copy files and the use git add to track them (don’t worry for now about what this “tracking” thing means). Some new concepts here, starting with “Untracked files”. Git can see our new file but it will not include it in the next commit. Now we can see that the added file is ready to be commited. So, let’s do it! The command below creates our first commit. The -m parameter is used to specify a commit message, which is essential for understanding the history of the project. As you can see, this is the same add command we’ve already used, when the file was still in the “untracked” phase. Even tough the command is the same, its meaning is slightly different here. We’ll cover this difference in the future as well. The message is very similar with one we’ve already seen, but notice that our file now is in the “modified” stage, instead of “new file”, which makes perfect sense. To wrap things up, run git status and you’ll see a familiar message: working directory clean, nothing to commit. I kept this article extremely simple, and that was by design. My intention was to show you some basic Git commands, so you can get the “feel” of what using Git is like. Where I’ve wrote “add it”, you know I’m talking about the git add command. You might have noticed that this particular command has two different usages, which is clearly evidenced by the different messages that git status shows us after running it. You’ve probably also noticed the different stags that a file can be in: “untracked”, “new file”, “modified”. they progress from one stage to the next one, like in a pipeline. In the next article of the series we’ll go a little more deep in this issues. We’ll understand the different “areas” that exist in a Git repository. We’ll understand Git’s basic workflow, and the stages our files can be in. We’ll also start to see one of the more important Git’s concepts: branches. We’ll see some common operations involving branches, and you’ll also learn how Git branches are different from those in TFS.